The National Association of Realtors has Certified Ron Carpenito with Expertise in Pricing Properties. 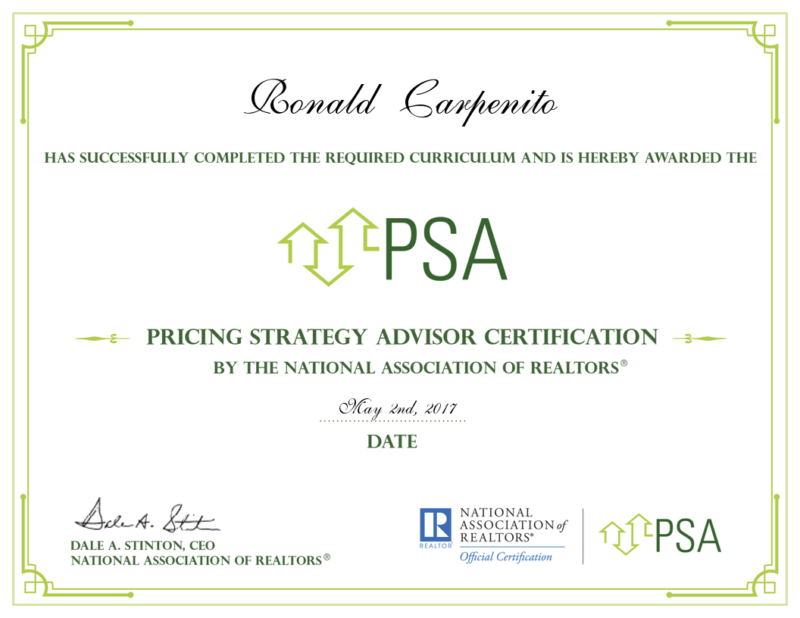 Ron Carpenito Lead Agent & Owner of the Prime Property Team at Keller Williams Realty in Andover, MA has earned the nationally recognized Pricing Strategy Advisor (PSA) certification. The National Association of REALTORS® offers the PSA certification to REALTORS® as determining property values depends more than ever on professional expertise and competence, the best use of technology, and a commitment to approach the pricing assignment from various perspectives. “The market demands accurate property value assessments, so NAR is excited to provide Realtors® with enhanced tools, education and expertise to determine the most accurate value for a home and give their clients a leg up when buying or selling,” said NAR President Tom Salomone. “Pricing Strategies: Mastering the CMA” is the required course for the PSA certification that provides REALTORS® with knowledge and skills to select appropriate comparables and make accurate adjustments, guide sellers and buyers through the details of comparative market analyses and the underlying pricing principles that inform them, and interact effectively with appraisers. Once awarded the certification, REALTORS® will be equipped to guide clients through the anxieties and misconceptions they often have about home values. Ron and the Prime Property Team provide real estate market expertise for home sellers and buyers locally north of Boston, in the Andovers, Merimack Valley area and through their VIP referral network, nationwide. Learn more about how the Prime Property Team can help you with selling or buying a home.